If you are needing an easy pattern that can be done in a day or two, or a great scraps buster, this is the pattern for you! This is a framed squares quilt design, which is an easy and versatile pattern. In preparing to write this blog post, I searched for framed squares quilts on Google, and really enjoyed seeing all the different interpretations of this pattern! Quilts remind me of snowflakes – each one so unique. While my scraps bins are overflowing, and I honestly should have tackled those first, I had some remnant pieces I had recently purchased that I was itching to use. While I usually try to incorporate some pieces of the past fabrics into my quankets, my supply of the larger pieces has really dwindled! And what I have tends to be odd colors and patterns, which is going to require some strategic planning on my part in how best to use them in a quilt. 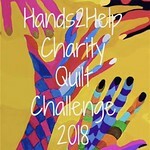 But, I am up to the challenge 🙂 In fact, I have another project on my quilt wall now that I am excited to show you in the coming weeks. This was donated to the County of Ventura, Children & Family Services, for a foster child in June, 2017. This is a framed squares quilt pattern. The center of each square came from a donation I received of a book of tablecloth samples. Carol reached out to me though my blog to let me know she had several tablecloth sample books that she would love to see used in a quilt. Thank you Carol for your donation! The inspiration for the name was twofold: the first is obvious, that they were actually tablecloth samples. The second is perhaps not as obvious. As I sat sewing this quilt, I thought a lot about the many fond memories I have of gatherings around a table: Birthday celebrations, Thanksgiving and Christmas dinner with family and friends; times spent when my two girls were little playing games at the table and now with them and their families playing games around the table! The name Around the Table just seemed right for this one. The overall design was inspired by Melanie over at Catbird Quilt Studio. I came across Melanie’s blog last month, and love how she uses borders in her medallion quilts. This is the perfect technique when quilting predominately with scraps, as it allows a quilt to grow to the desired dimension with (somewhat) ease and beauty. I only had enough of the tablecloth pieces in the chosen color values to get me to roughly 35″x50″. So, I borrowed a page from Melanie and added a border! The finish size came in right around 4’x5′, which is the size I aim for when making quankets for kids. The frames around the tablecloth sample pieces were all scraps from previous projects, while the edge binding was a new piece. When done, there were over 70 different fabrics that went into this quilt! I donated this quanket to Diana Jasany’s Girl Scout Gold Award project. You can follow Diana’s journey on her Facebook page. I am so thrilled to have found two kindred spirits over the past month who make quilts for foster kids: the fist being Nita who blogs at Because You Matter and now Diana!